Fall in Montana is about as close to Heaven as you can get and September 28th is a day that every hunter knows is a good day to be in the field. 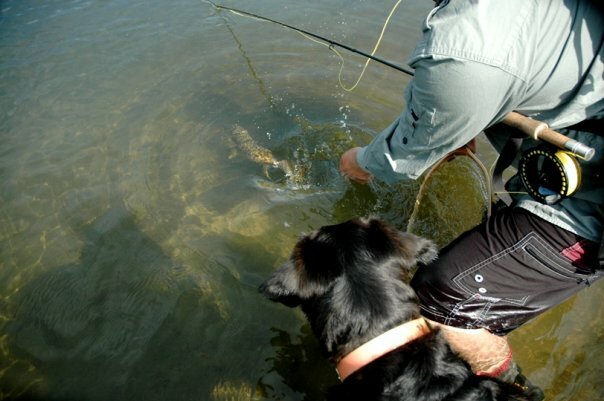 Tomorrow, Saturday, September 28th is National Hunting and Fishing Day. The bill establishing this day was signed into law in 1972. It’s a day when elk will be moving because of snow in the high country, trout will still be slamming hoppers and Montanans will be out in force, as usual, enjoying our public lands and public wildlife. It is a great sign that Secretary Jewell recognizes the need to maintain and expand access for hunters and anglers in every corner of this country. Hunting and angling are big business, a fact Jewell knows from her time at outdoor retailer REI. We also know that access alone isn't enough. We need to protect critical habitat that is essential to sustaining healthy populations of wildlife for now and future generations. With Congress, especially the House of Representatives, unable to see the forest for the trees on much of anything and continually stuck in the rut of budget squabble after squabble, we need leaders like Secretary Jewell to stand up, defend conservation and ensure that the world we're leaving to our kids is better than the one given to us. Policies like the Land and Water Conservation Fund, the North American Wetlands Conservation Act and making sure energy development is done responsibly in the right places all play a large part in our ability to hunt on public lands. We need bold leadership on these issues. As Teddy Roosevelt once said, "Far better is it to dare mighty things, to win glorious triumphs, even though checkered by failure... than to rank with those poor spirits who neither enjoy nor suffer much, because they live in a gray twilight that knows not victory nor defeat." Montana hunters and anglers have been at the vanguard in both stream access and access to public wildlife. We've also taken some firm stands when it comes to what that access should look like. Access doesn't mean a two track in every drainage. It doesn't mean jet boats on every square inch of water and it doesn't mean foot travel only on public lands. There is a balance that must be achieved both in terms of human use of the forest and maintain quality opportunity to harvest an animal on public lands. We’re also painfully aware of the loss of access to traditional lands – both public and private – as new breeds of landowners take over homestead farms and ranches. Secretary Jewell’s announcement that the US Fish & Wildlife Service will expand hunting and fishing opportunities on National Wildlife Refuges is greatly welcomed. It’s this kind of leadership that we need in Washington D.C. instead of more gridlock and partisan bickering. Here’s a tip of our Stormy Kromer to Secretary Jewell and to increasing public access to public land and public wildlife! Access for hunters but not anyone else. Congress isn't the only one who can't see the forest for the trees. Hunters alone cannot maintain the value for public lands. And if public lands are only advertized for hunters then you will leave a large portion of the public out. Apathy is a greater danger for public lands than access. Apathy creates the lack of access.